Click on any event for details such as time, address, and a link to register (Add to Cart). If you are looking to book your own Paint and Sip Party or Fundraiser, you may request any of the dates not already booked for another event. Kathy Smith will call to confirm the date and details. 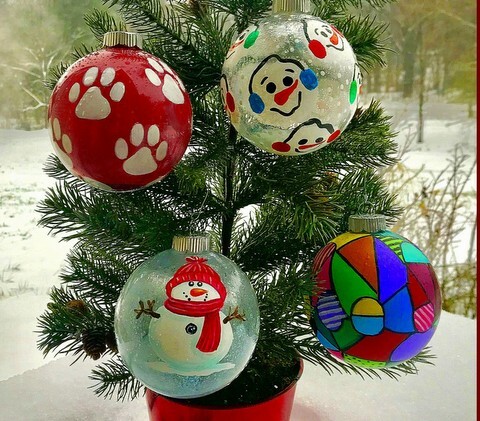 Paint 2 clear 4″ diameter plastic Christmas balls for your Tree. Personalize them with family or pet names. Templates will be available. Enjoy a holiday event with your family and friends. Plan to share some libations and fabulous food. People full of Christmas Spirit may attend, others will be added to Santa’s Naughty List and sent home. Copyright © Spirited Sisters Studio. All Rights Reserved.